'Rock Band 3' finally upgrades us to playing REAL INSTRUMENTS! This review was originally published 01/21/2011 on Game Observer (now defunct as of 05/13/2014). It has been republished here for archival purposes. Across-the-board interface improvements and incredible new Pro Mode make this the definitive music-rhythm game! This review is a bit belated. This is mostly due to the fact that I didn’t want to write a full analysis of the game until I had a chance to play the new PRO guitar mode, the controls for which weren’t available publicly until late December. So if you’re still on the fence about purchasing this game even though it’s been out since October, I hope this review helps. Fender Mustang controller (available late November 2010) has 102 buttons to simulate the lower 17 frets. Fender Stratocaster Midi guitar (available spring 2011) is a console-agnostic, fully-functioning, 6-stringed guitar equipped with pressure sensors in the neck for finger-placement detection. MadCatz Keytar (available at game release, but sold separately) is a two-octave midi keyboard that can be used to play keys, guitar, or bass parts of songs. Analysts and sales numbers may be suggesting that the music-rhythm genre is dying, but Harmonix isn’t letting that stop them from trying to innovate. 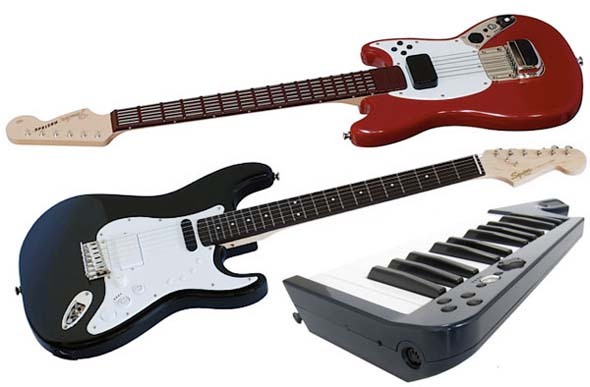 Rock Band 3 is a very ambitious project that adds a whole new instrument (the keyboard) and attempts to incorporate REAL INSTRUMENTS into the gameplay. I am thrilled to say that both of these new marquee features work excellently! The game’s menus and interface have also been streamlined to include more filters for selecting songs and new menu widgets for each player that they can open and close anytime they want to change settings, drop in or out, customize their characters, and so forth. Speaking of character customization, you now have much more options for creating your characters’ faces by mixing, matching, and editing different parts of the face (similar to the customization options allowed in The Sims). In my previous blog, I discussed my experience with the 2002 XBox game Steel Battalion. At the end of that blog, I mentioned that I had read that Microsoft and Capcom are developing a new Steel Battalion game, and that I would give my opinions on such a game in a future blog. Well, I didn't wait long to write that "future blog". According to this Joystiq article, Capcom and Microsoft are developing a Kinect-enabled version of Steel Battalion for the Xbox 360. The game is titled Steel Battalion: Heavy Armor and looks more like a remake/reboot than a true sequel. Harmonix is independent now, so what's next? Late last year, Viacom decided to sell the game developer Harmonix. Rumors suggested that Electronic Arts or even Activision might buy them out. Fortunately for the consumers, neither of those rumored deals was made! We all saw how Activision handled its ownership of Guitar Hero, effectively running the franchise (and possibly the music-rhythm genre, itself) into the ground by release one or two games every year! And we all also know how Electronic Arts's EA Sports brand has handled Madden NFL over the past 6 years with all competition in the pro football gaming market being effectively stamped out. No, fortunately for us gamers, Harmonix decided to set up a holding company in order to buy themselves and once again become an independent developer. As stated in an interview between Joystiq and Harmonix founder and current Vice President Chris Rigopolous, Harmonix has also severed ties with Viacom-owned MTV. So what's the future for Harmonix?